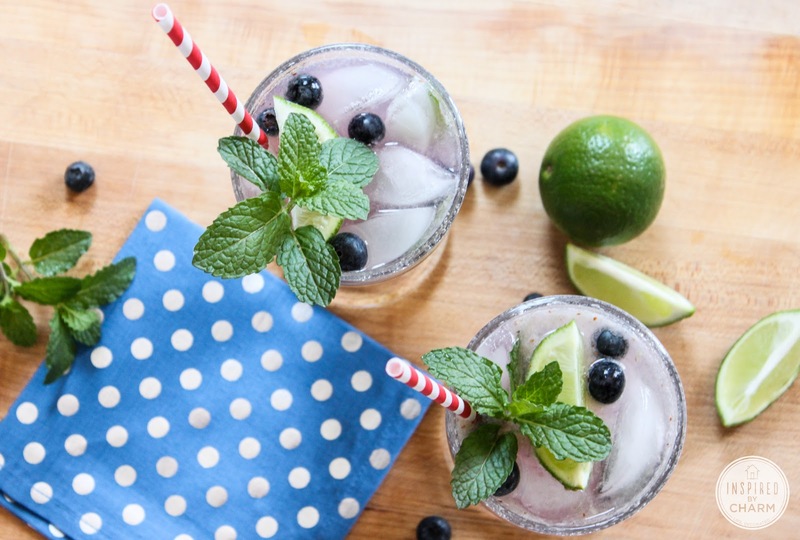 Today I’m serving up a delicious cocktail and some of my favorite links of the past week. I’m calling it – Drinks & Links! It’s Friday, and even if you work over the weekend, I hope you can take a moment for yourself. Turn on your favorite tunes (I’m obsessed with the new song Brave from Sarah Bareilles. ), pour yourself a cocktail, and check out some of my favorite links for the week. Considering the sunshine in the forecast fro this weekend, I decided a mojito would be most appropriate to start off this series. A few blueberries and some blueberry rum add a fruity twist to this classic drink. I’m a fan! 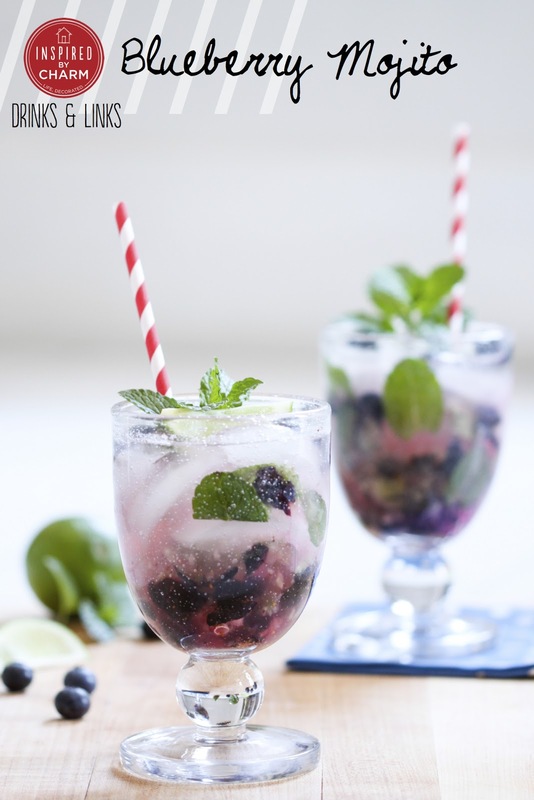 In the bottom of your glass, muddle/crush together blueberries, mint leaves, simple syrup, rum, and lime juice. Add some ice cubes, pour in club soda, and stir. 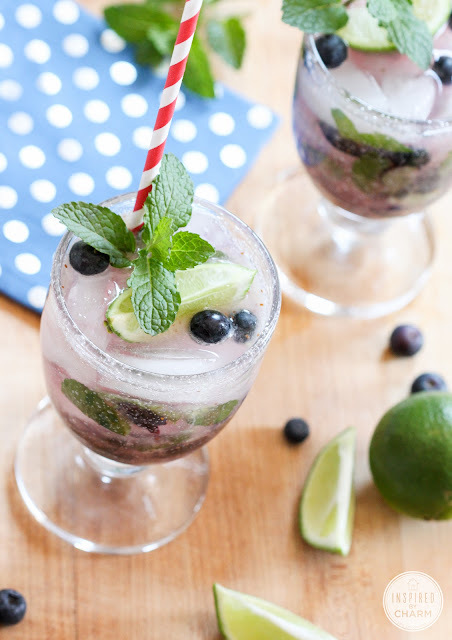 Garnish with a few blueberries, wedge of lime, a sprig of mint, and a super cute paper straw! *Bring 1/2 cup sugar and 1 cup water to a simmer over medium-high heat until sugar is completely dissolved. I usually let the mixture simmer for about 10 minutes to create a thicker syrup. Allow syrup to cool completely. 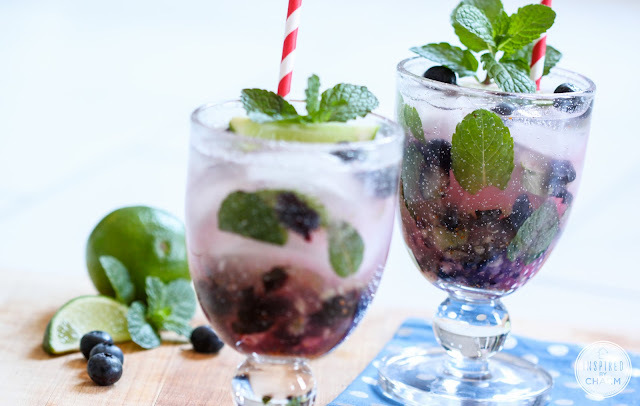 Okay, you’ve got your delicious Blueberry Mojito. Take a sip (or two), settle in, and let’s see what’s happening. Have you seen Jennifer Johner’s (of Dearest Someday’s) polka dot wall? I probably wouldn’t have the guts to do it, but I think it’s amazing. This commercial seriously made me ship my pants. I’m a sucker for anything with succulents. Check out how Mike Trobiano planted his favorites in some thrift store finds. Cats that look like male models!? Hilarious! Like I mentioned above, you need to listen to this song. Seriously. Like right now. Then after that, check out The Lumineers new single and video. The end is just pure joy. Gourmet S’mores!? Yes please. I’m dying to try these decadent combinations from Cooking Classy. Especially the Lemon Meringue Pie S’more. A Cat Teepee? Okay, I kind of want need one of these for my boys. I just may be a little obsessed with animal print these days. Here are twelve ways you can incorporate it into your home. Are you ready to rip out some of your kitchen cabinets and replace them with open shelving? Yeah, me too! When you do, you’re going to need some gorgeous glass canisters. These are some of my favorites. Planning a spring soiree? I have the dessert and decor already planned for you! Check out my favorite fruit-filled desserts and colorful entertaining accessories. Speaking of color, if you’re looking for inspiration or have a question, come visit me here. Cheers friends! Have an amazing weekend! OMGosh… this looks incredible! This, my friend, is why I grow mint every summer. 😉 Pinned! Yes! Yes! Mint is probably one of my FAVORITE herbs. I’m sure you’ve seen pineapple mint – gorgeous and delicious! There is fruit in it – of course you can have one for breakfast! Micheal, this looks amazing! Thank you for sharing, now I just need the ingredients (none of which I have)! What are you waiting for!? Get to the store! Pronto. You’re going to make one!? Get out of town!! Yes – please keep me in the loop. LOVE this concept! I always find that things like navigating the internet are best done with a cocktail in hand! PS – you’re right – the polka dot wall is fabulous, but I’d never personally do it. Yes – especially ones this delicious! Again these look delicious! The song is quite catchy! And those links were so good! Love the polka dot wall and the cats that look like models made me laugh so much! Thanks so much! Glad you are liking it all. Have a great weekend! looks weird when viewing from my iphone4. I’m trying to find a template or plugin that might be able to correct this issue. This sounds fantastic! Pinned to my CHEERS board. Can’t wait to try it.